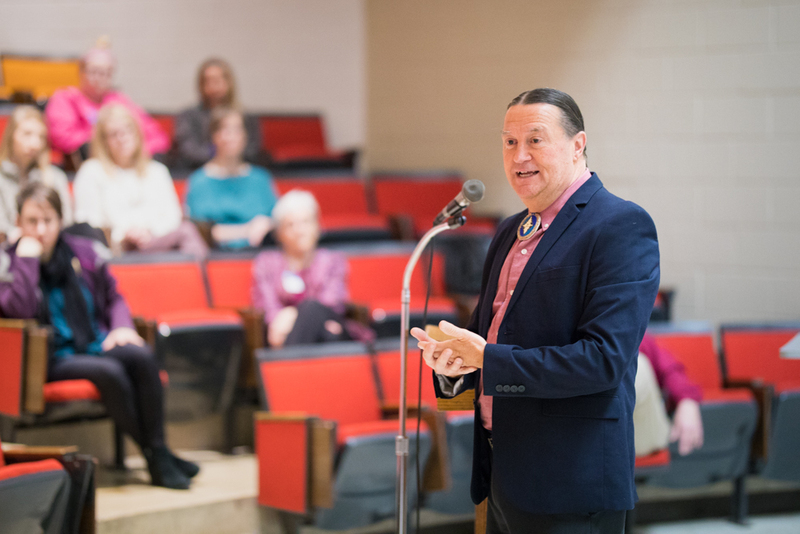 John Lowe, a 1981 nursing alumnus of Eastern Mennonite University and Florida State University professor, opened each of his six talks on campus in mid-February with a traditional and extensive Cherokee greeting that honored his ancestors and called his listeners into awareness of hundreds of years of his people’s history. The language was one Lowe didn’t use when he arrived from the Delmarva region to study nursing on campus from 1978-81, for the fear of calling attention to cultural and traditional ceremonial practices that had only recently been legalized by the U.S government. John Lowe speaks to a class of graduate students studying conflict transformation and restorative justice at Eastern Mennonite University. “That was our loss then, but we are grateful for your work and your time and your willingness to share your culture and history with us for these three days,” said Professor Ann Hershberger, who joined the nursing department faculty during Lowe’s senior year. She and graduate nursing program director Don Tyson were instrumental in extending the invitation to Lowe, the nursing program’s sole alumnus selected for the prestigious professional honor of Fellow in the American Academy of Nursing. In 2016, Lowe established and became the director of FSU’s Center for Indigenous Nursing Research for Health Equity. At EMU, Lowe gave a Suter Science Seminar and a chapel talk, as well as addressing pre-professional health sciences and nursing majors; graduate students in the biomedicine, conflict transformation and restorative justice programs; and the Peace Fellowship. 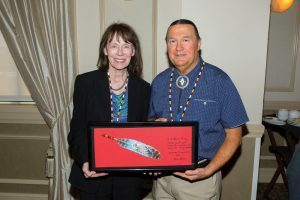 Lowe spoke of his own life and professional experiences, as well as providing a historic and cultural context for the educational, health and socioeconomic disparities of Native Americans. In acknowledging his ancestors of Cherokee, Creek, and Lenape descent, Lowe calls on influences very much alive and present in his work today. When he was 10 years old, a 32-year-old cousin, recently returned from the Vietnam War, died of causes related to alcoholism. Even at that young age, Lowe recognized powerful forces were at work. “My grandmother said, ‘It got another one of us,’ and that stuck with me. Because of that grief and watching what happened, I saw devastation and abuse and what the ‘it’ did. ‘It’ became part of my purpose. The ‘it’ never left me,” Lowe told an audience of nursing students. In the years since that childhood loss, Lowe has become a globally renowned expert on substance abuse among indigenous peoples while earning a master’s degree in nursing at Oral Roberts University and a PhD from the University of Miami. Among his many honors are the 2016 Luther Christman Award from the American Nurses Association, for exceptional male nurses, and several top awards for research and teaching from the Florida Nurses Association, American Health Council, American Academy of Nursing, the Association for Medical Education and Research in Substance Abuse, and the U.S. Department of Justice, among others. Lowe is the first director of FSU’s Center for Indigenous Nursing Research for Health Equity,the only one of its kind worldwide. At a 2017 inaugural summit, he welcomed more than 100 indigenous nursing researchers and community leaders from Australia, Canada, Panama and Peru, as well as Native Americans, Alaskan Natives and Native Hawaiians. After many years of development, monitoring and evaluation, Lowe earned the US Department of Justice endorsement of his intervention programs for the well-being of Native American youth. The programs utilize traditional talking circle formats and culturally-based models to reduce substance abuse and other high-risk behaviors and have received funding support from agencies such as the National Institutes of Health (NIH) and the Substance Abuse Mental Health Service Administration (SAMHSA). Lowe continues to develop intervention models that integrate traditional practices with technology so that indigenous youth in different areas of the United States and even in other countries can engage in cross-cultural sharing sessions. Hershberger observed that many of the nursing students — approximately 90 from all program levels were invited to a morning seminar with Lowe — were shocked to learn more about the “current realities of health disparities for Native Americans.” This was especially noteworthy information coming from Lowe, who shared that his high school guidance counselor told him “people from where you are from don’t go to college.” He is, she added, one of 23 Native American nurses in the United States to have earned a doctorate degree. Educational, economic and health disparities go “hand-in-hand” with dispossession of lives, land and culture, Lowe said. Many students were moved by Lowe’s sharing, both of historic injustices and those he has personally experienced. 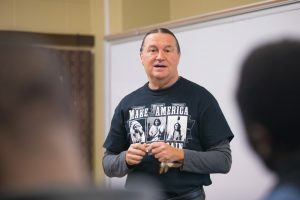 “One student was awestruck by how Native Americans have been treated historically, but also how John exudes grace in telling the story and being able to move forward,” Tyson said.